March marks the beginning of a new growing season. It’s a very exciting and joyful time in a garden, with seeds germinating, new plantlets coming up all around, early buds turning into blossoms, bees starting to come out, and all that glorious early spring sunshine! The early Spring herbs (nettles, chickweed, cleavers, plantain, dandelion greens, etc) are very abundant now, and most other plants have popped up as well. This is the perfect time to enjoy them in salads, when the young shoots are tender, fresh and full of energy. 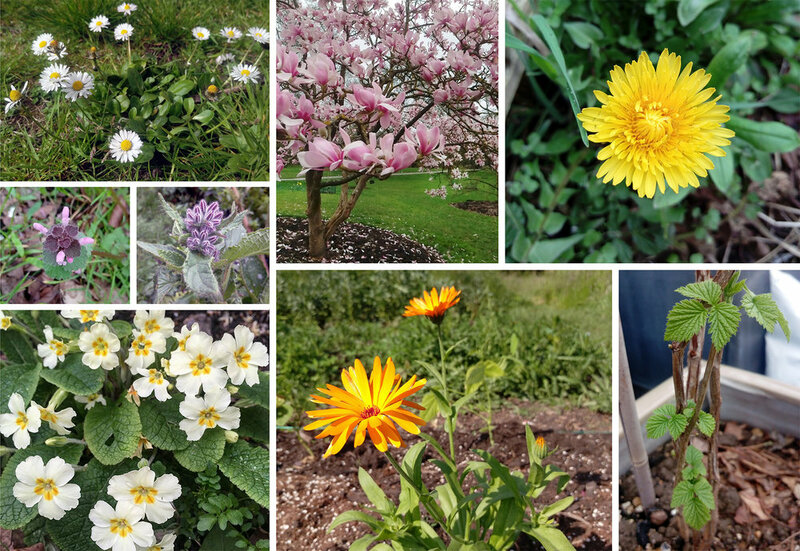 Spring is barely here, but there are a lot of flowers out as well - Magnolias, Primroses, Calendulas, Dandelions, Daisies and Violets are only some of the wonderful edible and medicinal flowers out at the moment. Explore the many ways in which dandelion flowers can be consumed - Use the petals in teas, salads or baked goods. Pickle them, ferment them (into wine), or even fry them! Give Lemon Verbenas a good pruning. Top dress your pots and herb plots with some fresh compost. As spring arrives, so does the sowing season! Now it is the perfect time to be starting new plants. For a higher success rate, start your plants indoors and transplant them to in a month or two once the weather is warmer. As we begin a new cycle once again, it is a wonderful time to acknowledge the seasonal shift into Spring and, having probably spent a large part of Winter indoors, reconnect with nature. As the Spring tonics like cleavers and nettle come through, they remind us that Spring is a time of cleansing, cleaning out and renewal. When drinking some cleansing nettle tea or cleaver infused water this month, perhaps you could think about what else could be cleansed that is no longer serving you. An app on your phone you could do without? A judgement you could let go of? Maybe 5 items of clothing that no longer ‘spark joy’ to make way for something new? It’s also a wonderful time to watch out for signs of Spring... observe the daffodils as they begin to make way for the opening of bluebells, begin to look out for and smell the blossom all over our streets or notice the change in brightness of the sunlight.